The role of the Medieval Squires during the Medieval times of the Middle Ages was an important step to achieving the status of a Knight. The Medieval Squire was a servant to a knight during the Medieval times and era. The Norman predecessor of what came to be known as squire were called Armigers. Medieval Squires had already served 7 years in the role of a page before moving to the role of a Squire at the age of 14 years old. As a page he was viewed as a boy, and looked after by the ladies of the court or castle. Medieval Squires were viewed as young men and had reached the age of puberty, their first step towards manhood. The care of the Medieval Squires moved from the Medieval ladies to the Knights. This page describes how was a life of a squire in the medieval times. The word Squire is derived from the French words "Esquire, Escuyer" which originally meant 'shield bearer'. In later years the term gradually moved away from the meaning of apprentice knight and on to mean a country gentleman of some standing. nobility from any other man than a knight. school of the order of knighthood." Ramon Lull is clearly describing the role of the Medieval Squires in this interesting quote. The Medieval Squires served in this role and performed their duties for seven years and became a Knight at the age of twenty-one. Sometimes knighthood was conferred on a squire at an earlier age as the reward for bravery on the battlefield. In time of war Medieval Squires accompanied Knights on the battlefield, leading and tending the horses and dressing them in the Medieval Knights Armor. They came under fire from arrows and many Medieval Squires were killed doing their duty. Medieval Squires who had either grown too old to qualify for knighthood or who were unable to afford the expense of knighthood were called 'Arma Patrina'. 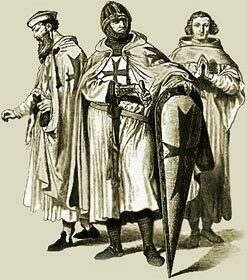 These men were were allowed to carry a lance and shield even though they had not undergone the ceremony of knighthood. The Medieval Times website provides interesting facts, history and information about knights of old which scatter the Medieval History books including Medieval Squires. The Medieval Times Sitemap provides full details of all of the information and facts about the fascinating subject of the lives of the people who lived during the historical period of the Middle Ages. The content of this article on Medieval life and times provides free educational details, facts and information for reference and research for schools, colleges and homework for history courses and history coursework.